As I mentioned in my post Hebrew family and genealogy terms, I have wanted to translate my English genealogy forms into Hebrew for some time. 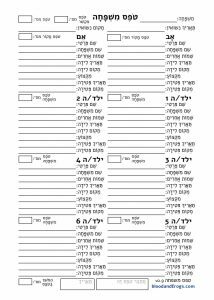 I’m happy to announce the first version of my Hebrew genealogy forms are now available. These forms are designed to work together. 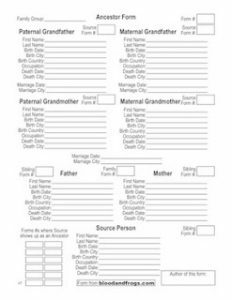 You could start, for example, by filling out an Ancestor Form (טֹפֶס יוּחֲסִין), and then filling out similar forms for each of the grandparents, using them as source persons at the bottom of the forms. 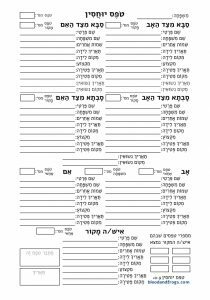 You could also add a sibling form (טֹפֶס אַחַאי) for each of the parents, and then for each sibling on those forms you could add a family form (טֹפֶס מִשְׁפָּחָה) showing their spouse and children. The forms are PDF format and can be printed out and filled out by hand. At a later date I will be updating them to allow them to be filled out on the computer. The reason they do not currently support editing on the computer (like the existing English forms) is that the software I am using to make the forms editable has a problem using the Hebrew font I used in the form. The company that makes the software is aware of the problem and is looking into it. Hopefully they will resolve the issue soon, and I will be able to update the forms at that time. I welcome comments and constructive criticism in the comments below. There has been some debate with people I showed these forms to as to exactly what words and phrases to use in each case. I’m sure not everyone will agree with what I have chosen, and I’m willing to revise some of the terms in the future if I’m convinced they need to be changed. Once thing that is clear from putting these together, and in putting together my earlier Hebrew family and genealogy terms list, is that not all genealogy terms that exist in English have been set in Hebrew, and it is my hope that by starting the conversation on these terms, and using them in forms like this, we can come to a consensus on what terms to use in Hebrew. 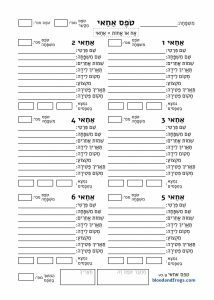 So if you might find Hebrew genealogy forms useful, then check out the Hebrew Forms page, and download them.